The Las Vegas terror attack has left our nation shaken, but there’s a deeper side many ignore. Through the calls for gun reform from the left versus complaints of politicizing a tragedy from the right, emerges another independent narrative from Muslims, people of color, and immigrants. Ask most who fit that description and two parallel thoughts crossed their minds as they heard about the Las Vegas attack. What a horrible tragedy, and God I hope he’s not [my minority demographic]. Muslims, people of color, and immigrants have withstood 2017 with bated breath - knowing that statistically it is only a matter of time before a person from our respective community commits an act of public violence. And we know the collective unjust backlash that will follow. Notwithstanding that 63% of mass shootings in America are by white men, studies show that media narratives convince society of a grotesque double standard - non-Muslim white men who commit terrorism are simply mentally deranged while Muslims who commit terrorism act deliberately. This manifested once again during the Las Vegas attack. Just a day before the Las Vegas attack, a Muslim in Canada injured five people. Fortunately, no one was killed, however that did not stop media from labeling it as a terrorist attack. Meanwhile, as Steven Paddock’s assault on Las Vegas unfolded, media refused to call it terrorism. Instead, while acknowledging no evidence existed that Paddock was tied to Daesh, media reported Daesh propaganda that he converted to Islam some months prior - and in that context claimed it was terrorism. Additional investigations have uncovered that Paddock had bomb making material and 1600 rounds of ammunition in his car—in addition to over 40 firearms. Yet, the word terrorism is ignored. Last month Edward Henderson of Elk Grove, California - a 47 year old white male - was caught in possession of a live bomb device. Held on $510,000 bond, the word terrorism hasn’t once been mentioned. In March, 28 year old James Harris Jackson traveled from Maryland to New York specifically to kill black people - and succeeded in killing 66 year old Timothy Caughman for his race as an African American. Again, terrorism wasn’t once mentioned. In January, Alexandre Bissonnette target killed six Muslims in a mosque due to his hatred of Muslims. Evidence demonstrated he was radicalized online due to right wing propaganda and during the Presidential campaign’s anti-Muslim rhetoric - yet he will not be charged with terrorism. Since the administration’s initial failed travel ban in January, Americans with guns have murdered more than 11,500 Americans. Refugees have not harmed, let alone killed a single American. Meanwhile, immigrants and refugees have struggled through three travel bans while gun legislation remains non-existent. In the name of national security, we are banning thousands of persecuted refugees who have never once killed a single American, while celebrating gun laws that permit over 30,000 American deaths per year. 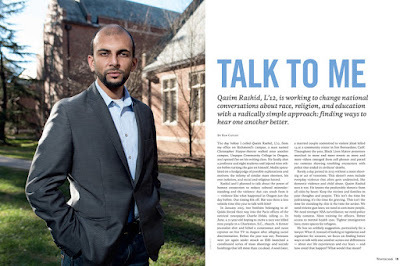 I’m a Pakistani American with family who served, a Muslim dedicated to the Qur’an’s emphatic requirements of racial justice, a lawyer sworn to uphold the US Constitution, an Ahmadi Muslim led by a true Islamic Caliphate dedicated to universal human equality, and a husband and father of boys and girls. I share this to demonstrate the intersectionality across race, religion, the law, gender, and nationality to combat the collective ignorance and hatred fueling the double standards impacting us all. Gun violence and terrorism harms us all. Rather than demonizing minorities for political points, it’s time we stood for the tenets of justice and equality upon which this nation was founded, and made decisions based on facts, not falsehoods. The Las Vegas attack may have left us shaken, but we can find stability in unity. After all, we are the United States of America. It’s time we act like it.